The little tablet that could is growing up a little more as the Tablet Wars shift to the virtual bookstore aisles. Hot on the heels of Amazon’s Android App Store, Barnes & Noble has announced what they’re calling “the next phase” of their nook developer program. Along with a bunch of new dev tools and services, B&N is also now accepting third party app submissions to be sold through its forthcoming nook Color app store. After signing up at nook Developer and being approved, devs may submit their apps for approval. You know, just like any other app store. 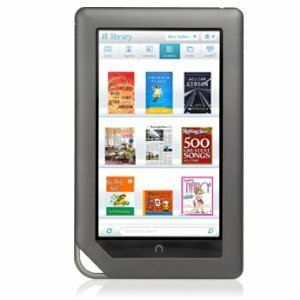 Developers will receive 70% of app sales revenue through the nook program, with B&N taking the other 30%. You know, just like any other app store (more or less). The language of today’s press release encourages devs to submit paid apps, but also mentions that they’ll be able to offer “Free trials” of their wares. nook Developer was actually launched last year to encourage development of reading-centric apps, and B&N is now moving their baby into more of a psuedo-tablet category with the impending rollout of what they’re calling a “major firmware update.” Said firmware promises email functionality and the first wave of apps in a custom store. Whether or not the upgraded device will support other Android 2.x apps remains to be seen; for what its worth, the press information referenced “rich, immersive and vivid paid and free apps that are specifically optimized for NOOK Color.” That could mean reading-specific apps, that could mean all kinds of apps built to NC’s specs (ARM Cortex A8, 1024 x 600 display), or that could mean existing Android apps ported to fit NC. Only Barnes & Noble really knows for sure. We are the world’s largest bookseller with 40 million customers and 45,000 bookselling experts at more than 1300 retail outlets in 50 states. We sell nearly 300 million books every year and we’re the second largest retailer of magazines in America with 5,500 magazine titles and 1,000 newspapers.